We report back on the best Toyota models that attended a new Japanese car festival hosted at Castle Combe circuit. The entry-level TMG GT86 Cup begins this weekend, with six cars competing for glory at the Nürburgring. What Car? 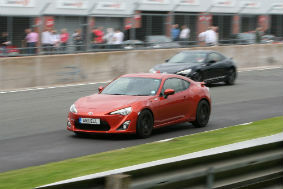 took four readers to France to test drive the all-new Toyota GT86. Find out what they thought in this video. We’re taking the Toyota GT86 on a 1,000-mile continental dash back to the UK, and you can follow our progress live on Twitter! BTCC star and the first person to drive a Toyota GT86 in Britain, Frank Wrathall speaks to Toyota about racing, the GT86 and getting behind the wheel of articulated lorries… Guess which he likes most?